Formulation is attracting an increasing amount of interest in the fields of psychology, psychiatry, psychotherapy and counselling. Drawing on psychological theory, it attempts to examine a client or family's problems in terms of how they arose and what may currently be holding these in place. It synthesises this information and explanatory ideas into 'working hypotheses', which are then used to suggest appropriate and effective ways of working to relieve the problems. It can also be described as the key way of relating theory to practice in clinical work. Formulation in Psychology and Psychotherapy places this growing interest in formulation in a clinical and historical context. 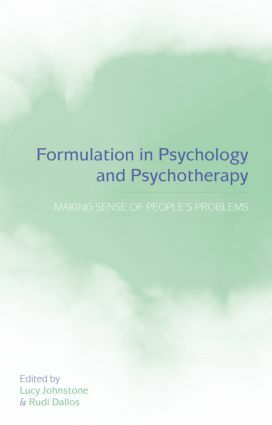 It introduces the reader to the theory and practice of formulation through the discussion of two clients (one adult and one child focused problem), whose problems are formulated from the perspective of 5 different therapeutic traditions: systemic, psychodynamic, community, cognitive - behavioural and social constructionist/narrative. It looks at the growing trend for formulations that draw on two or more therapeutic models and includes two chapters dealing with integrative formulation. It offers some creative suggestions for how this can be carried out in a way that is theoretically coherent and clinically effective. The authors also explore the important issue of formulation as a collaborative activity, and consider the ethics of formulation. The final chapter takes a critical overview of the main research, controversies and debates in the area, and gives a guide for using, developing, and researching formulation in a way that maximises its strengths while being aware of its limitations. The book is unique in including newer therapeutic approaches such as narrative therapy and social inequalities; it critiques and takes forward recent work on integration, and provides a lively and challenging critical evaluation of the area as a whole. It guides readers through a complex field in a clear, accessible and engaging way. Both experienced and novice clinicians will be able to enhance their clinical skills and theoretical knowledge.